Prior to joining Skoltech, Alexei served as Deputy Dean of Science at the Department of Chemistry of the Moscow State University. He holds membership on Moscow State University’s board of Nanotechnology Education and various expert panels. Previously, he was a fellow at the Institute of Mathematics and Fundamental Physics, CSIC acting as an expert for the Spanish Ministry of Education and Science. He has also worked around the world as a visiting scientist at the Paul Sabatier University, Goteborg University, University of Warsaw, ITAMP, University of British Columbia, Oakland University, and others. 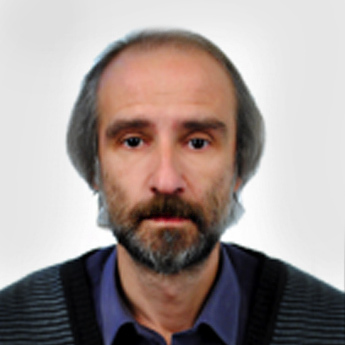 Buchachenko’s theoretical and computational modeling research focuses on electronic structure theory, atomic and molecule collision theory, photodissociation and collision dynamics, and high precision spectroscopy. His research is currently related to cold and ultracold atomic and molecular physics and chemistry. He also takes part in projects on heterogeneous chemistry for thermal protection systems on spacecraft. Alexei thinks that a qualified theoretician should serve the community of scientists conducting experiments and collaborates with many groups around the world. His master’s of science degree in chemistry and Ph.D. in physics and mathematics are from Moscow State University. He also holds the title “doctor of science” in physics and mathematics from Moscow State University. N. N. Kleshchina, K. A. Korchagina, D. S. Bezrukov, and A. A. Buchachenko, Modeling of manganese atom and dimer isolated in solid rare gases: Structure, stability, and effect on spin coupling, J. Phys. Chem. A 121, 2429 (2017). T. V. Tscherbul, P. Brumer, and A. A. Buchachenko, Spin-orbit interactions and quantum spin dynamics in cold ion-atom collisions, Phys. Rev. Lett. 117, 143201 (2016). D. G. Artiukhin, E. J. Bieske, and A. A. Buchachenko, Ab initio characterization of the electrostatic complexes formed by H2 molecule and Cr+, Mn+, Cu+ and Zn+ cations, J. Phys. Chem. A 120, 5006 (2016). L.-G. Tao, N. N. Kleshchina, R. Lambo, A. A. Buchachenko, X.-G. Zhou, D. S. Bezrukov, and S.-M. Hu, Heat- and light-induced transformations of Yb trapping sites in an Ar matrix J. Chem. Phys. 143, 174306 (2015). A.A. Buchachenko, A.V. Stolyarov, M.M. Szczesniak, and G. Chalasinski, Ab initio long-range interaction and adiabatic channel capture model for ultracold reactions between the KRb molecules, J. Chem. Phys. 137, 114305 (2012). A.A. Buchachenko, Anisotropy of the static dipole polarizability induced by the spin-orbit interaction: the S-state atoms N-Bi, Cr, Mo and Re, Proc. Roy. Soc. A 467, 1310 (2011). T.V. Tscherbul, A.A. Buchachenko, A. Dalgarno, M.-J. Lu, and J.D. Weinstein, Suppression of Zeeman relaxation in cold collisions of 2P1/2 atoms, Phys. Rev. A 80, 040701(R) (2009). E. Garand, A.A. Buchachenko, T.I. Yacovitch, M.M. Szczesniak, G. Chalasinski, and D.M. Neumark, Study of ArO- and ArO via slow photoelectron velocity-map imaging spectroscopy and ab initio calculations, J. Phys. Chem. A 113, 4631 (2009). D. De Fazio, S. Cavalli, V. Aquilanti, A.A. Buchachenko, and T.V. Tscherbul, On the role of scattering resonances in the F + HD reaction dynamics, J. Phys. Chem. A 111, 12538 (2007). T.V. Tscherbul, A.A. Buchachenko, M.E. Akopyan, S.A. Poretsky, A.M. Pravilov, and T.A. Stephenson, Collision-induced non-adiabatic transitions between the ion-pair states of molecular iodine: a challenge for experiment and theory, Phys. Chem. Chem. Phys. 6, 3201 (2004). A.A. Buchachenko, T.A. Grinev, J. Klos, E.J. Bieske, M.M. Szczesniak, and G. Chalasinski, Ab initio potential energy and dipole moment surfaces, infrared spectra, and vibrational predissociation dynamics of the 35Cl−…H2/D2 complexes, J. Chem. Phys. 119, 12931 (2003). A.A. Buchachenko, N. Halberstadt, B. Lepetit, and O. Roncero, Ar…I2: A model system for complex dynamics, Int. Rev. Phys. Chem. 22, 153 (2003). R. Prosmiti, A.A. Buchachenko, P. Villarreal, and G. Delgado-Barrio, Modeling of H5+ potential energy surface: a first attempt, Theor. Chem. Acc. 106, 426 (2001). A.A. Buchachenko and N.F. Stepanov, Ar-I2 interactions: The models based on diatomics-in-molecule approach, J. Chem. Phys. 104, 9913 (1996).